“Easter Dreams” from Christian Faith Publishing author Robert Van Fossen is an entertaining children’s picture book that tells the story of how a wise little rabbit called Mr. East R. and his rabbit friends decide to bring the abundance of candy from their home in Dream Land to all the boys and girls of the world on one of the most important days of the year—Easter Sunday. “Easter Dreams”: an imaginative children’s book that brings the story of Jesus together with the legends of Easter bunnies and candy baskets. 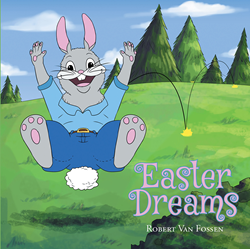 “Easter Dreams” is the creation of published author Robert Van Fossen, a young father inspired by the Christian values instilled by his mother and distressed with the loss of the true meaning of Easter for the children of future generations. Robert Van Fossen piques the imagination when he writes, “This is the story of a wise old rabbit named Mr. East R. and his great event. My story begins in the Land of Dreams, which is not like any other place, because the Land of Dreams can only exist in the minds of the young and old alike who can believe in the magic of fantasy. Published by Christian Faith Publishing, Robert Van Fossen's new book is a great mixture of religious truths and secular traditions in a fun story with beautiful illustrations that children of all ages will enjoy. Engaging and memorable, Robert Van Fossen’s book will be the perfect story to read every year on this important holiday. View a synopsis of “Easter Dreams” on YouTube. Consumers can purchase “Easter Dreams” at traditional brick & mortar bookstores, or online at Amazon.com, Apple iTunes store, or Barnes and Noble. For additional information or inquiries about “Easter Dreams”, contact the Christian Faith Publishing media department at 866-554-0919.